More accurate than any other tool or conventional method, the Gates EZ Align® quickly identifies common types of misalignmwnt, including angular, parallel and 3rd plane misalignment. It is lightweight, compact and durable, with no small parts or targets can get lost. 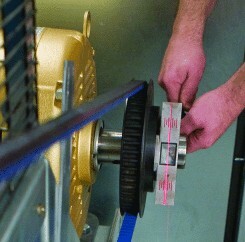 the EZ Align can measure spans up to 6 feet or better and can be used on any size pulley, large or small.